There is a common misconception that the Florida Everglades is just a giant, grassy swamp. It’s actually made of several different habitats, each full of distinct flora, including trees. When you visit the Everglades, you’ll notice many clusters of trees standing tall against the wet prairie and sawgrass marsh. These small hammocks are known as Everglades tree islands. Tree islands are small forests that sit on land just dry enough for them to take root. But, there’s more to it than that. Everglades tree islands are formed on land that is elevated just slightly, in some cases only by inches! They can be made of tropical hardwood trees, ferns, cypress, and other topical plant species. Before the Everglades were drained in the 1920’s, the freshwater sheetflow went around the tree islands. As a result, many of them have an elongated, teardrop shape, with the rounded end pointed toward the water flow. 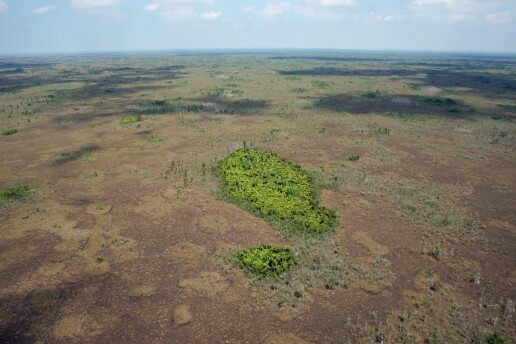 Being the only spots of dry earth outside of the pine rocklands and hardwood hammocks, tree islands can act as a dry oasis for Everglades wildlife. Reptiles, birds, and mammals that feed in the wet prairie use them for shelter to rest or hide from predators. Many birds, including the Everglades snail kite, nest on these islands. White tailed deer also frequent them, because if they spend too much time in water they can develop hoof rot, which can be fatal. The ground that Everglades tree islands rest on was long-believed to be bedrock that slowly rose over time. It was recently revealed by a team of scientists that these spots were middens, garbage piles from centuries-old human settlements. The researchers found bones, shell tools, and charcoal, which would’ve helped create an elevated dry area where plants could grow. The phosphates from the bones acted as fertilizer, and the roots reached further into the bedrock for water. This setup helped tree islands to not only form, but continue to thrive now! Everglades tree islands don’t just add an air of mystery to this ecosystem. They enhance its unique beauty as well as its elevation, and also provide homes to countless animals. Taking a private airboat tour at Mack’s Fish Camp can give you the chance to see them up close! They can crawl, fly and even swim. Some of them look strange, some of them beautiful, and there is a variety of Everglades insects you’ll see when you visit Mack’s Fish Camp in South Florida. While there are large animals in the Everglades that are better known, like the American alligator and the manatee, we can’t overlook these little guys. Insects play a big role in the Everglades ecosystem, which stretches over many different habitats. As a link in the Everglades food web, insects are not only a food source for fish, reptiles and amphibians. They also act as pest control for Everglades plants by eating other insects as well as helping with pollination. There are nearly 100 different butterfly species in the Florida Everglades, a diversity as incredible as their many patterns and colors. Most butterflies are diurnal, so they’re easily spotted during the daytime. Butterflies are very mobile, choosing where they live based upon available resources. 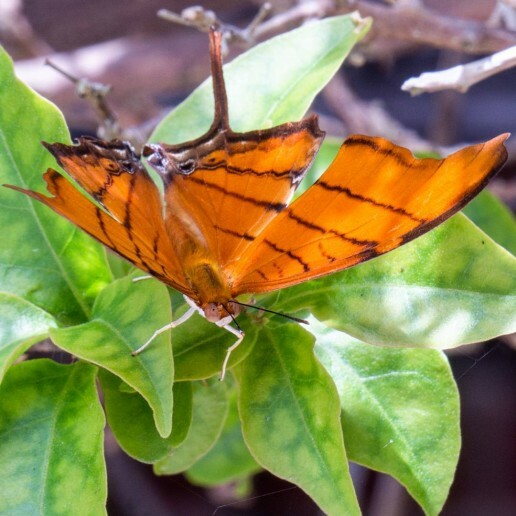 Some species prefer specific types of host plants to rest in, like the ruddy daggerwing. It prefers strangler figs, wild banyan trees, and common figs or their host plants. While you’re on an airboat ride at Mack’s Fish Camp, you might notice what looks like bubbles zipping around in circles on the water. They’re actually whirligig beetles, aquatic insects that dwell on water surfaces. Whirligig beetles have divided eyes that can see above and under the water at the same time! If threatened, they can dive underwater and stay submerged because of a small air bubble they trap between themselves and the surface. Proof that not all colorful Everglades insects move gracefully through the air, the lubber grasshopper is easy to spot. They sport bright greens and yellows with hints of red, and grow up to 3 inches in length. Lubber grasshoppers get around by jumping and walking, but they’re not very quick. So, you could easily snap a good picture of one should it cross your path. 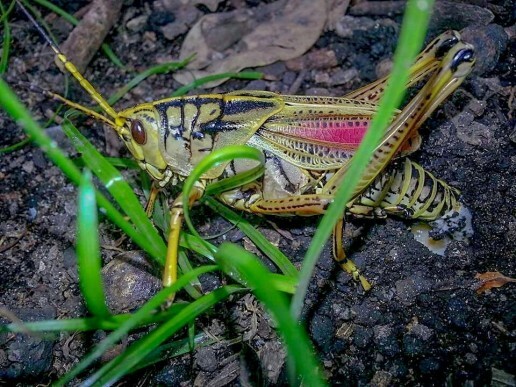 You might think the lubber grasshopper is an easy target for predators, given its bright colors and slow movement. But, they are very toxic to eat and their vivid colors act as a warning to discourage anything from trying! 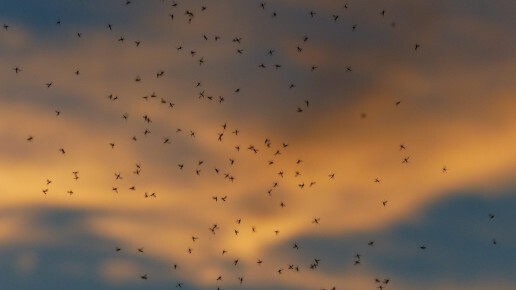 The most well-known, and infamous of Everglades insects is the mosquito. Despite being a pest to humans, they are arguably the most important insect in the Everglades food web. By laying their eggs and dwelling near water, mosquitoes are a vital food source to fish, frogs, lizards, and other insects. They are most abundant during the wet season, but their numbers drop sharply in the cool, dry winter months. They may not be the first sort of Everglades wildlife you hope to see when you visit the River of Grass. But, insects are as much a part of Everglades ecosystems as egrets and alligators. Even if creepy crawlies aren’t your thing, they can still be a pretty sight to behold! A lot of cold-blooded creatures love being in the subtropical climate of South Florida, and it’s not just the tourists. More than 50 different species of reptile live in the Florida Everglades. 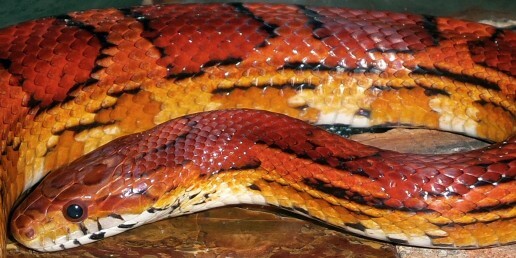 Reptiles are among some of the most well-known animals found here, and come in a variety of colors, shapes and sizes. 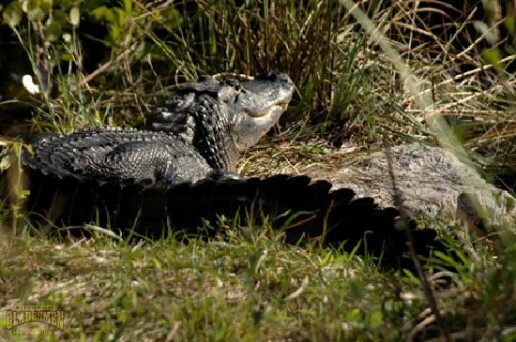 On a private airboat tour at Mack’s Fish Camp, you’re likely to see several of these Everglades reptiles. Here are the different types of them that call the Everglades home. These shelled reptiles can be found swimming in freshwater marshes and swamps, or basking in the Florida sun near water. The most common turtle species in the Everglades is the striped mud turtle. It can be identified by the three yellow stripes that run down its back and stripes on its face. 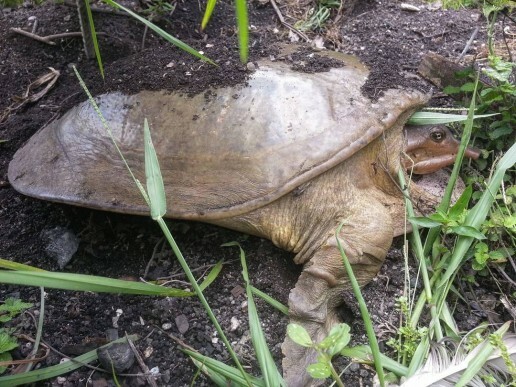 The Florida soft-shelled turtle is a more unique species, having a long neck and snorkel-like nose. The only time you’ll spot one on land is when they lay their eggs, as they spend almost all of their time in water. Being the order of reptiles that alligators and crocodiles belong to, that makes them the most popular of Everglades reptiles by default. Crocodilians are defined as being predatory, semi-aquatic reptiles. As you can imagine, the Florida Everglades is a paradise to them, and they are the kings of it! 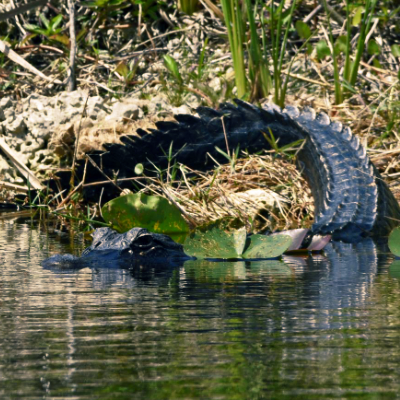 While crocodiles prefer the saltwater portions of the Everglades, alligators can be found floating in freshwater marshes or basking in the sunshine. Crocodilians sun themselves to regulate their body temperature. Second only to mosquitoes, Everglades snakes are the least-liked creatures here, and perhaps even more misunderstood. All of them are shy and not aggressive unless threatened or disturbed, even the venomous ones. There are only 4 species of venomous snakes out of the nearly 30 species found in the Everglades. Venomous snakes like the Cottonmouth and non-venomous ones like the red rat snake help manage the Everglades rodent populations. Their shyness and camouflage patterns let them hide in sawgrass marshes and even in the trees of hardwood hammocks. We can’t leave out these (mostly) little guys. They may not be intimidating dinosaurs like alligators, but there are nearly 20 lizard species in the Everglades. So they have strength in numbers. Green anoles and their nonnative cousins the brown anole can be spotted in trees by their bright red throat pouches. Their much larger, invasive cousin, the knight anole, is often found on tree trunks hunting insects and other anoles. 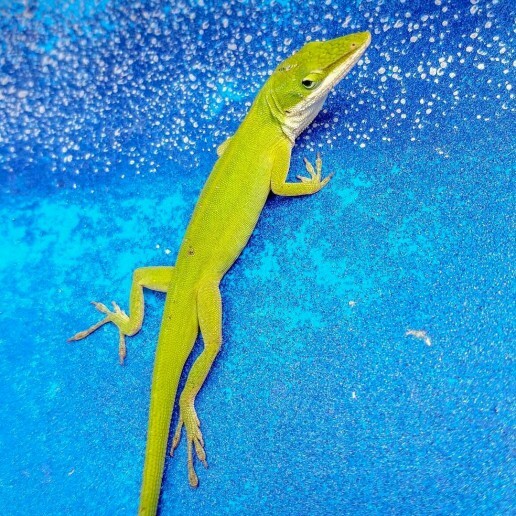 Despite being around 18 inches in length, knight anoles can camouflage themselves well. However, they can be spotted by the yellow flash marks under their eyes. The biodiversity of the Florida Everglades is one of its most cherished traits. Everglades reptiles big and small reside in this ecosystem, beside the many wading birds and among the different habitats. 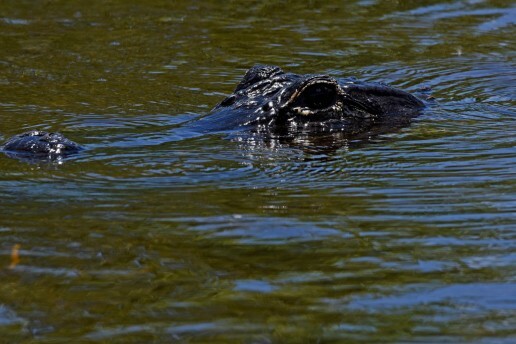 The Everglades can appear so massive on an airboat ride that it can be easy to overlook the little things. If that happens, then look closer, because those little things may just be great at hiding. 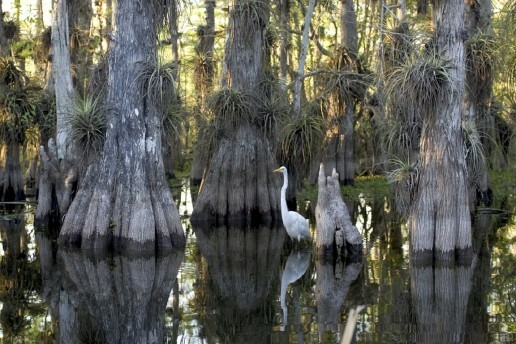 You may know that the Florida Everglades spans over 2 million acres. But did you know that it was once over 11 million acres in size? That remaining 2 million acres is there thanks in large part to the efforts of Marjory Stoneman Douglas. After publishing her famous book, “Everglades: River of Grass”, she worked to raise awareness of the Everglades ecosystem. She also pushed back against development in the Everglades, and devoted much of her 108 years to protecting it. Born April 4, 1880 in Minneapolis, Minnesota, a short and ill-fated marriage got Marjory to reunite with her father in Miami in 1915. Her father was the founding publisher at the Miami’s first newspaper, known today as The Miami Herald. She served in the Navy Reserve during World War I, and was the first woman in Miami to enlist. Marjory left the Herald in 1923 and worked as a freelance writer, which lead to the writing of her most famous work. While working as a freelance writer in the 1940’s, Marjory was approached to write about the Miami River. As she researched the story, she became fascinated with the Everglades and began researching them too! In 1947, Marjory published “The Everglades: River of Grass” The book details the system of water flow from the Kissimmee River through Lake Okeechobee into the Everglades. Marjory explained that the Everglades wasn’t the swamp that most people though it was, but a slow-moving river! With the attention and support she received upon the publishing of “River of Grass”, Marjory became directly involved with Everglades conservation. She devoted herself to preserving the sheet flow of the Everglades and educating people all over Florida to be aware of its importance. In doing so, she rallied many to Everglades conservation, which lead to the founding of Friends of the Everglades in 1970, which Marjory was the head of. The legacy of the Gladesmen Culture is traditions built upon the marshes and limestone of the Everglades. 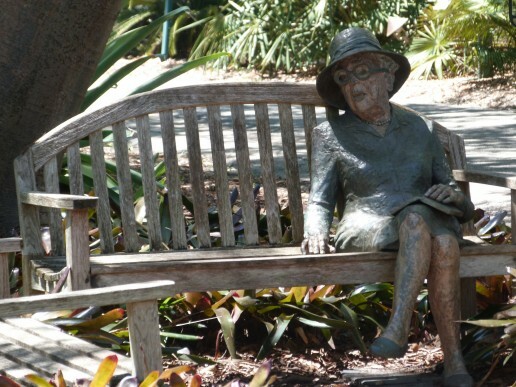 The passion, commitment, and drive of Marjory Stoneman Douglas forged her legacy, which is the preservation of this ecosystem. Without her tremendous efforts, the Everglades would be just a memory. When you visit Mack’s Fish Camp, we get to share both of our legacies with you. Where does the third largest living snake in the world sit? If it is in Florida, wherever it wants to. 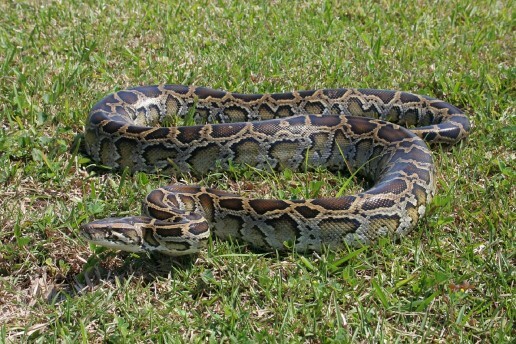 Burmese pythons have earned a reputation for slithering their way to the top of the Everglades food web since their first sightings in the 1980’s. 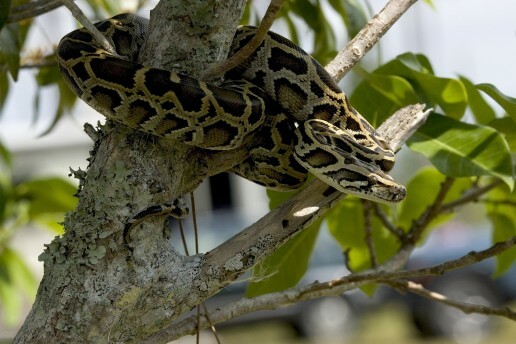 These massive constrictors have become the most notorious invasive species in South Florida, but why? They likely arrived the way most Everglades invasive species do, being released by pet owners or the exotic animal trade. So, how is this particular invasive seemingly taking over the Everglades ecosystem? Burmese pythons reach maturity between 18 months and 4 years of age, and females can produce a clutch of 35 to 50 eggs or more. They also have a lifespan that can last up to 25 years. With impressive stats like these, it makes their numbers difficult to track. There are many invasive species that have adopted the Everglades as their home. Burmese pythons are not only suited for the South Florida climate, but the Everglades ecosystem is like home to them. Originating from the rainy jungles and swamps of southeast Asia, these semi-aquatic creatures are right at home on the River of Grass. By preying on the American alligator, Burmese pythons are now the apex predator of the Everglades. But they have another title that’s helped them thrive as they have: Hide And Seek Champion. They prefer hiding in underbrush or in holes near rivers, and are also great swimmers. In addition to being able to camouflage themselves, they’re nocturnal. So, their numbers are harder to accurately track, because most recorded sightings are made during the day. You would consider a guest that can eat anything as not being a picky eater. But, if that guest starts eating everything they can, you’d have only your own words to eat. Burmese Pythons have been found to eat a wide variety of Everglades wildlife, including rodents, bobcats, deer, and even alligators! Their big appetites have like to a steep decline in sightings of rabbits, raccoons, and possums. Because of this, it’s earned the nickname “The snake that’s eating the Everglades”. South Florida may never be fully rid of these pythons. But, it’s possible that through implementing practical and effective control methods that their population could be managed someday. When you go for an airboat ride at Mack’s Fish Camp, hopefully you don’t see this Everglades invasive species. While they are shy as most snakes, it could mean trouble for other Everglades wildlife. Alligators may not be colorful like herons, or be cute and small like green tree frogs. But the power, agility, and strong presence they display in the wild fascinate both locals and Everglades visitors alike. 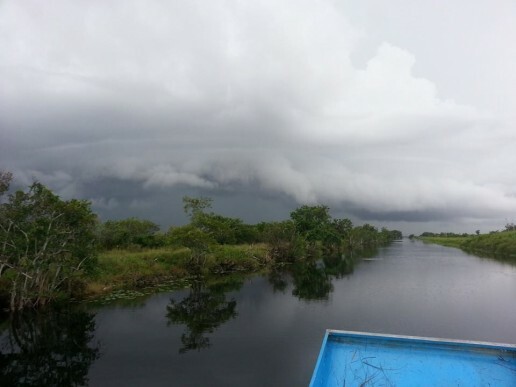 Taking an airboat eco tour, you can learn many interesting things about Everglades alligators. For now, here are a few things you might not know about these living dinosaurs. They Can Jump… and Climb! In addition to being nimble swimmers, alligators can jump six feet into the sir from a resting position! This leaping ability is mostly for ambushing prey near the water. But they can use it to grab onto tree branches and climb to their prey. Alligators prefer to stay in or near water, and their strong tails help them swim at a speed of up to 20 to 30 miles per hour (MPH). But if they see a potential meal hanging out near the edge of the water, they can bolt after it on land. As big and heavy as they are, alligators are capable of moving in short bursts up to 15 MPH on land. Like some reptiles, the temperature of an alligator’s nest determines whether the alligators will be male or female. A temperature below 82.4 degrees Fahrenheit will produce females, and a temperature above 91.4 degrees Fahrenheit will produce males. An even number of both males and females will be produced if the temperature is near 87.8 degrees Fahrenheit. Despite their beastly hunting instincts and solitary nature, Everglades alligators give back to their community, whether they realize it nor not. In fact, that solitary nature helps other Everglades wildlife thrive. When alligators make their homes, called alligator holes, they clear old vegetation away in the marsh. This makes room, for new growth after they abandon their dwelling. Abandoned alligator holes also serve as an oasis to birds and fish during the Everglades dry season, when water becomes scarce. Everglades alligators are not only the most iconic of all the animals here, but the most significant. While they are wild animals and formidable predators, their shyness around humans makes them perfectly safe to view on an Everglades airboat tour. Out of the over 350 animal species living in the Everglades, longer animals like alligators and Burmese pythons get all of the attention, but what about the little guys? If you look closely, there are frogs, toads, newts and other species of amphibians you can spot on an Everglades eco tour. Amphibians are a class of Everglades wildlife that are as big a part of this environment as wading birds or snakes. Amphibians are cold-blooded animals that can live on land and in water. In fact, their name comes from the Greek word “amphibios”, which means ”both kinds of life.” When amphibians are young, they spend the first half of their lives solely in the water, then on land after they have physically matured. Unlike reptiles, that prefer to be in or near water, amphibians don’t have a thick outer layer of skin, but a soft thin skin that has to remain wet. Many amphibians can actually breathe through their skin as well as through their lungs. 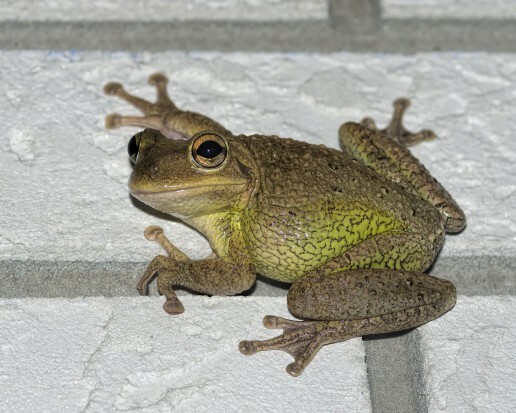 Residing in wet, humid, and moist habitats, amphibians are a class of Everglades wildlife that are right at home here! Dwelling and nesting near water helps define their role in the Everglades food web. Like their skin, amphibians’ eggs are very soft and need to remain in water. Amphibians and their eggs are a food staple of many Everglades wading birds, like herons and wood storks. But, amphibians feed on insects like mosquitoes, who also lay their eggs in bodies of water. The time of year that amphibians are most active in the Everglades is during the wet season, which lasts from May through November. The abundant moisture and humidity, and the increased activity of insects allow amphibians to thrive. No matter how many frogs and toads you might see, you’ll hear hundreds more croaking and chirping. 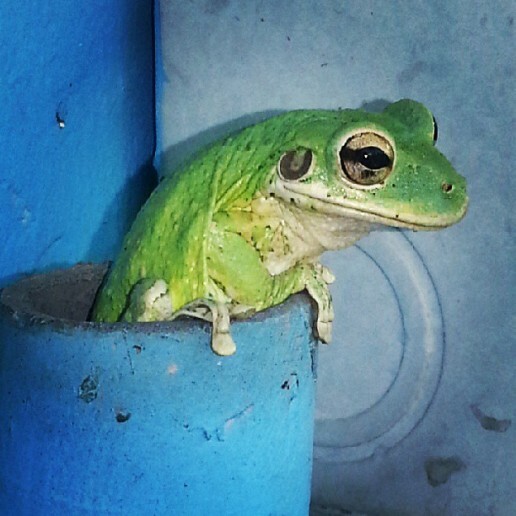 The best way to see amphibians like the green tree frog, everglades dwarf siren, and the many other species of Everglades wildlife here is on an airboat ride. 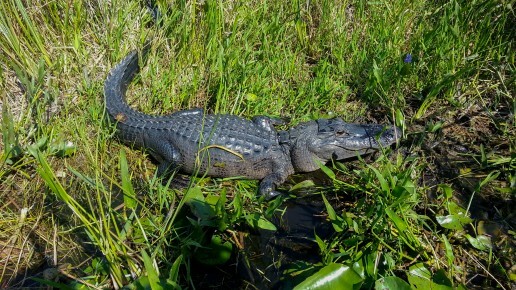 On an everglades eco tour, you can observe the biodiversity of this unique environment while learning from true-born Gladesmen that have lived here for generations. South Florida is a paradise for fans of the outdoors, especially those who love fishing. The Everglades has an ecosystem that is home to large numbers of Peacock bass and largemouth bass, along with other species like Florida gar and tarpon. A popular fishing spot, the Everglades holds a record for the most fish caught per person per hour, which is impressive when taking into account Florida’s many lakes and rivers. If you’re a professional angler or it’s your first time fishing, here’s how you can have the experience of a lifetime Everglades fishing at Mack’s Fish Camp in Miami. 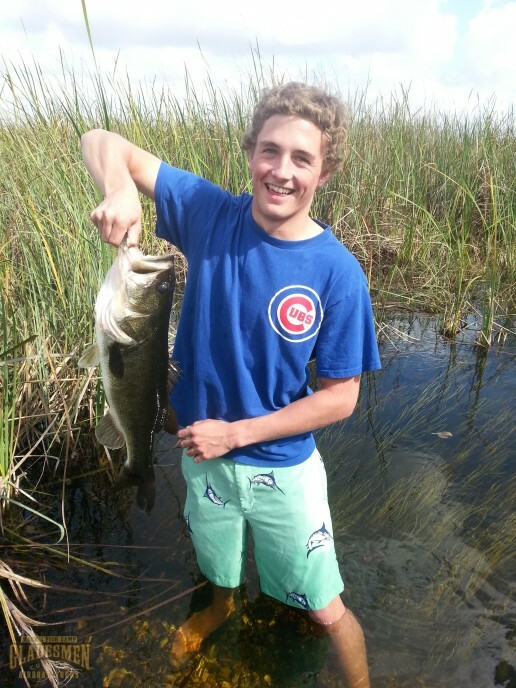 At Mack’s Fish Camp we have everything you need to have a fun and successful Everglades fishing trip. We offer jon boat rentals, and sell tackle, beverages and snacks at our store. But, if you’d like to have some help navigating the Everglades, and are up for some exploration while you do, Mack’s Fish Camp offers airboat bass fishing guide service. Gladesmen who have fished the Everglades since they were born will be your knowledgeable guides, showing you both great fishing spots and the unique beauty of the River of Grass. On this 4-hour Everglades fishing trip, you’ll be provided with tackle, fishing rods and reels, sunscreen, bug spray, and a cooler packed with refreshments from our store. Bass fishing on an airboat has its own distinct advantages. Because airboats move by a propeller that’s above the water, their movement doesn’t disturb fish as much as traditional boat motors do. Also, airboats can navigate over shallow water in marshes, allowing more access to areas of the Everglades than regular boats can. But in addition to an amazing fishing trip, you’ll be treated to an to an airboat ride where you’ll see many species of Everglades wildlife up close. The Everglades is home to many birds like egrets, roseate spoonbills, great blue heron, and is the only place in the world where alligators and crocodiles coexist. Bass fishing in the Everglades provides a great time in truly unique and beautiful place. At Mack’s Fish Camp, taking an Everglades fishing trip while enjoying an airboat ride provides a thrill for the whole family. 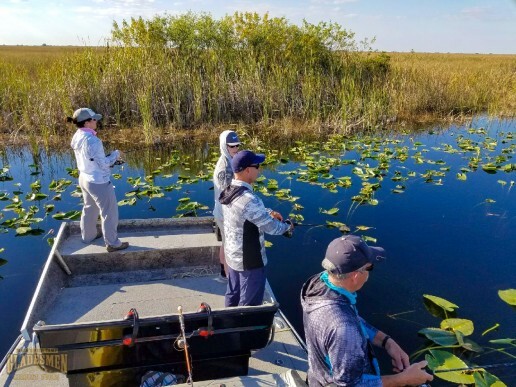 Whether fishing alone or with a guide, the Florida Everglades provides plenty of great weather, incredible scenery, and of course, plenty of fish! Of the many species of wildlife that live in the Everglades, there are only a few that are well-known. The American alligator, Florida panther, and many wading bird species are the first animals people associate with the Florida Everglades. There are also several other Everglades animals native to Florida that make their home here as well, but are overlooked. Here are four of these Everglades hometown heroes. This medium-sized bird of prey differs from other raptors, as it feeds on mollusks, primarily snails. 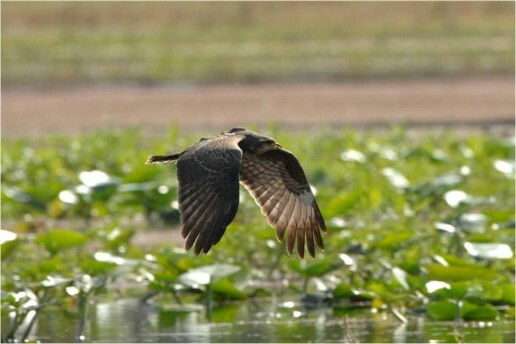 Snail kites are easily identified by their slender, curved bills, which help them to easily extract apple snails, their primary prey, from their shells. Their very specific diet depends upon the water levels and water quality of the Everglades, and they are listed as endangered due to habitat degradation affecting apple snail populations. 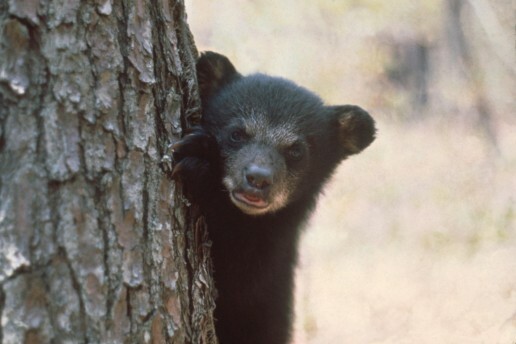 The only species of bear found in Florida, the Florida black bear has adapted to living in a subtropical habitat. It mostly thrives on acorns, palmetto berries, nuts, and holly as well as colonial insects like ants, termites, bees, and wasps. During their breeding season in the summer, black bears consume 5000 calories a day! Florida black bears favor habitats that have a dense understory, and can be found in the forested sloughs, oak scrubs, pine rocklands, and other wooded areas in the Everglades. This colorful bird is found in marshes throughout the tropics, but it’s only year-round residence in America is the Florida Everglades. Named for its mostly purple feathers, its green back, red and yellow bill, blue forehead and long, yellow legs make it a walking rainbow. 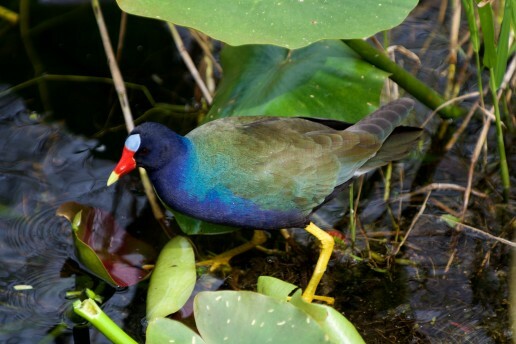 The purple gallinule also has very long toes to allow it to walk on lily pads and floating vegetation without sinking. One of three species of mink living in Florida, the Everglades mink can be found in swamps and freshwater marshes. These aquatic mammals are nocturnal hunters and fierce fighters, capable of attacking prey larger than them. 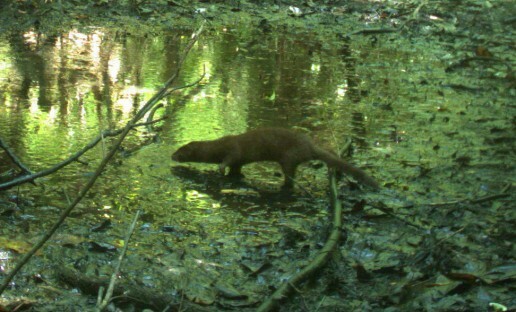 Everglades mink activity has been observed to increase before storms and other changes in weather. These Everglades animals might not have the star power that alligators and roseate spoonbills do, but their uniqueness to the Florida Everglades makes them equally as important. When you take a private airboat tour at Mack’s Fish Camp, you get a chance to see the magnificent creatures in their natural habitat. Like the Gladesmen Culture that has thrived here for generations, so do countless animal species.